But the unique synergy between Tarja’s classical and rock inspirations is fully expressed in her solo rock career. By now she released four multi-platinum and gold awarded albums My Winter Storm (2007), What Lies Beneath (2010), Colours In The Dark (2013) and the most recent ones The Brightest Void/The Shadow Self (2016). After the successful release of the unexpectedly dark album From Spirits And Ghosts (Score For A Dark Christmas) (2017) and the following Christmas shows, Tarja is ready to offer a closure for her recent heavy rock albums, with her second live video and CD. Following the same line of its predecessor, ACT II will be released in summer 2018. After a few bumpy steps and stones in the band’s line-up, STRATOVARIUS song writing found its peak in their recent studio works Elysium, Nemesis and Eternal. All milestones in sound, creativity and songwriting. It happens rarely nowadays, especially in metal, that a band creates one magic song after the other. STRATOVARIUS are surely one of the few exceptions. Recently STRATOVARIUS presented their long awaited “Best Of” album, which included 29 hits and fan favorites (and there could have been more!). As well as started a reissue campaign of all their 16 studio albums, with one of the band’s most successful and most loved albums Destiny (originally released in 1999) and the cult live album Visions Of Europe (originally released in 1998). The series will be continued in summer 2018 with the not less loved albums Episode (originally released in 1996) and Visions (originally released in 1997), again packed with rare and newly recorded bonus material. 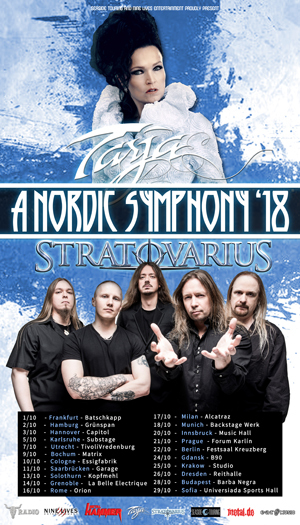 Now these two major players from Finland decided to go on A Nordic Symphony ‘18 Tour together and not only who is aware of both acts history can hint that this will have some more exiting surprises than just outstanding extra ordinary shows by Tarja with her band and STRATOVARIUS!